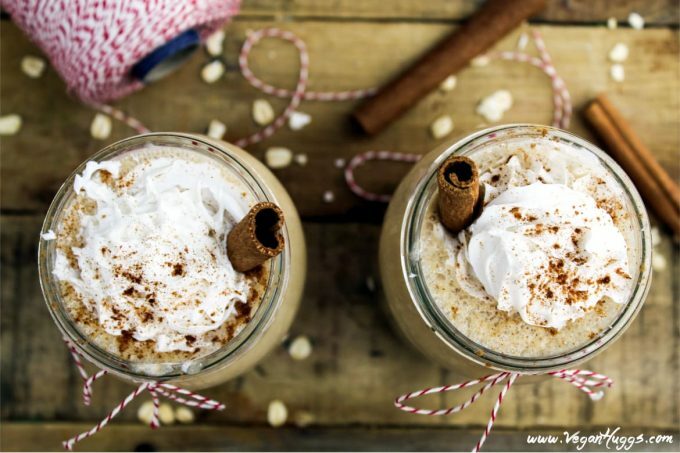 This healthy Apple Pie Smoothie is the perfect fall treat. It’s creamy, dreamy & nutritious. It’s vegan, gluten-free & guilt-free, too. Now we all remember that saying “an apple a day, keeps the doctor away”, right? Well, it doesn’t mean an apple-a-day in the form of apple pie (Darn!). However, this Apple Pie Smoothie is the next best thing. You can enjoy this on a daily basis and ward off those pesky doctors, because this heavenly treat is loaded with vitamins and minerals. Ok, let’s be real…you may not avoid all doctor visits with this Apple Pie Smoothie, but you will definitely be nourishing your body and strengthening your immune system. Sounds good to me! This dreamy fall creation is hearty, healthy and scrumptious. The flavors are reminiscent of grandma’s apple pie, but without all the added sugar and fat. Now before I get lynched by grandma, I better clarify something… I’m not trying to say this replaces grandma’s apple pie, but it’s a healthier alternative on a daily basis. So, when grandma brings her famous apple pie for the holidays, go ahead and indulge (If it’s vegan, of course). This refreshing Apple Pie Smoothie is so darn easy to make. It takes about 10 minutes and It’s perfect for those busy mornings. You can head off to work feeling energized and satisfied. The kiddos will love this apple-licious treat, too. They will have a full belly and big warm smiles. You can feel good about serving them this protein-packed & nourishing treat. It’s wholesome, hearty and healthy! I added lots of love to this creamy glass of deliciousness. For the base, I used almond milk, but any plant-based milk will work. It’s naturally sweetened with crisp apples and medjool dates, so there’s no need to add sugar. To make it thick, I used creamy almond butter and rolled oats, which also adds a nice bit of protein and fiber. For that apple pie flavor, I added some cinnamon, vanilla and a pinch of nutmeg. To make these extra special, I topped them with some fresh coconut whip and added a cinnamon stick (which also doubles as a straw). These little add-ons aren’t needed, but are nice if you have the extra time. If you are looking for other smoothie recipe ideas, you might be interested in this Almond Joy Smoothie. It’s full of flavor and nutrient-packed. If you make this Apple Pie Smoothie, or one of my other recipes, I’d love to hear from you. Leave a comment below and let me know what you think. It would make my day. You can also follow me on Instagram and share your creation with me, Just tag me @veganhuggs and hashtag #veganhuggs. So, are you ready to enjoy this apple pie in a glass? Let’s do this! 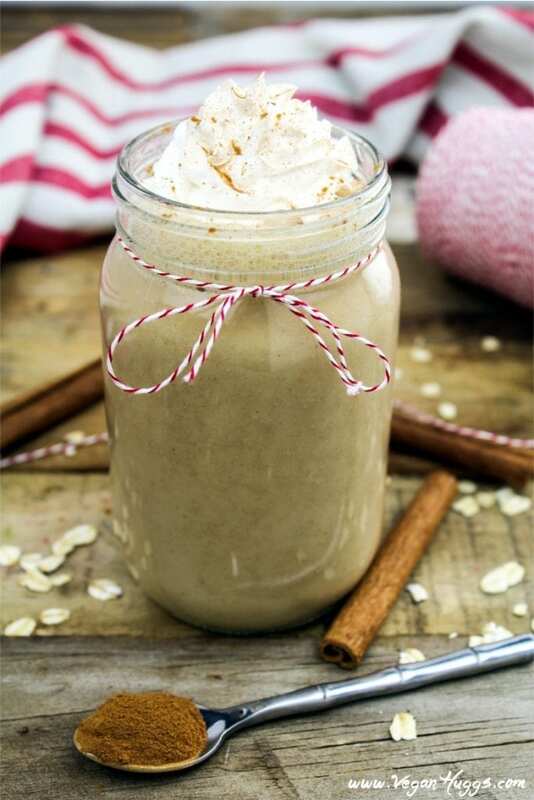 This Apple Pie Smoothie is the perfect breakfast treat. It's creamy, dreamy and nutritious. Place all ingredients into your blender. Blend on high until creamy and smooth. 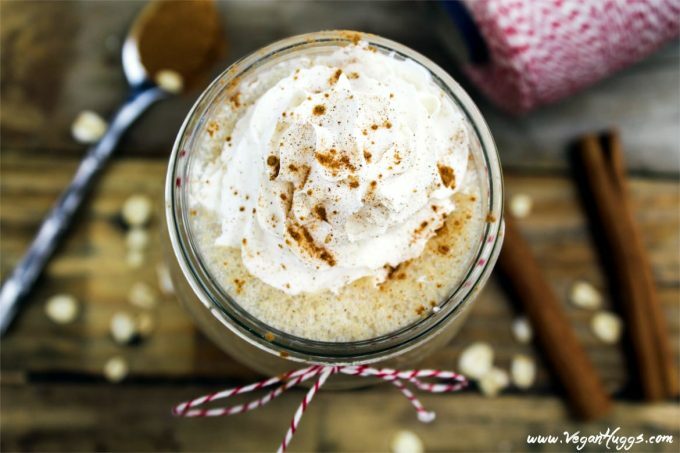 Pour into your favorite glass and top with some vegan whipped cream & dust with cinnamon. Enjoy! *Other nut butter ideas: cashew, walnut, sunflower seed and macadamia. Peanut butter works, but it will make the smoothie taste a little peanut butter-y. *Heathy filler ideas: Chia seeds, hemp seeds & flax seeds. Pick 1-2 fillers and use 1 tablespoon each. You can also throw in a small handful of walnuts, pecans or cashews. Love me a good apple pie anything! Such great flavors, and smoothie is always a win! I love smoothies that take the form of dessert. This looks delicious. Mmmm, now this is my kind of apple pie! I’m not a pie person when it comes to normal “pie form” but when it’s in the form of a smoothie, bar, bite, oatmeal, granola, I’m always game! 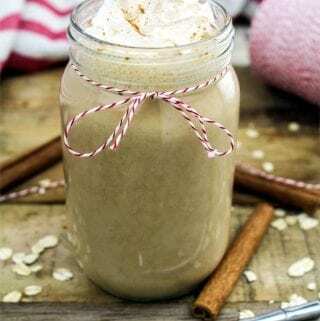 This apple pie smoothie looks delicious! I can’t wait to try it!